has earned TripAdvisor.com highest rating based on Guest Reviews! 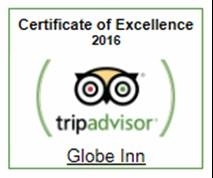 The Globe has earned TripAdvisor.com highest rating based on Guest Reviews! My husband and I visited for our honeymoon. I wanted to let you know that we were very pleased with our accommodations. The service was more then we could have expected and everything was so comfortable. I was looking up the web site for the phone number so that I can make our reservations for our one year anniversary. I stayed at the Globe Inn last week and I would like to thank / congratulate you and your personnel for the beautiful refined place and excellent service. The waitress that serve us in the dinning room Tuesday night was classy and very nice, a special thanks to her. I love also your needle point curtains. Do you have some pictures of the inside showing the needle point curtains, my wife would like to put some in our antique 125 year old house. We will back to your place during our next visit!